Willamette University’s Hallie Ford Museum of Art is pleased to present the “Crow’s Shadow Institute of the Arts Biennial.” The exhibition opens Nov. 9 and continues through Feb. 2, 2014 in the Study Gallery and the Print Study Center and has been organized by Willamette University Professor of Anthropology Rebecca Dobkins and Crow’s Shadow Press Master Printer Frank Janzen. The exhibition highlights 27 contemporary prints created by 14 artists at the institute during the past two years. The exhibition includes work by established Native American artists Rick Bartow and James Lavadour, as well as emerging and mid career native and non-native artists from the Portland area, including Pat Boas, Eva Lake, Jenene Nagy, Blair Saxon-Hill and Storm Tharp. 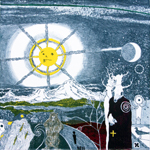 Crow’s Shadow Institute of the Arts is located on the Umatilla Reservation in northeastern Oregon and was founded by painter and printmaker James Lavadour (Walla Walla) in 1992. The institute seeks to provide educational and professional opportunities for Native American artists to utilize their art as a vehicle for economic development. Housed in the historic St. Andrew’s Mission schoolhouse, the facility features a state-of-the-art printmaking studio, classroom, computer lab, library, archive, and gallery space. Since 2010 the Hallie Ford Museum of Art has served as the official repository for editioned prints created at the institute and maintains the collection for archival, research, and educational purposes. "The Crow's Shadow Institute of the Arts Biennial" is supported by an endowment gift from the Confederated Tribes of Grand Ronde through their Spirit Mountain Community Fund, with additional support from the City of Salem's Transient Occupancy Tax funds and the Oregon Arts Commission.